Itinerary: Meet at the hotel dock to gear up for your Lake Atitlan adventure package Atitlan nature reserve zipline paddleboard. It is best to wear your swimsuit or other appropriate boating attire as you will get wet along the way. Start out with professional instruction to help you enjoy the paddle. We supply dry sacks for your backpacks and other gear for the second part of the day. Be sure to bring your camera, drinking water, and some sunscreen. We paddle for 60-90 minutes along the shores of Santa Cruz la Laguna, Patzizotz, Jaibal, and the Buenaventura Bay. You will have many up close encounters with Mayan men who fish from hand hewn cayukas as they have for centuries. You will feel privileged to share the lake with these proud fishermen who make Lake Atitlan so unique. You paddle along rugged cliff faces filled with exotic plant and bird life. You have the opportunity to cliff- jump into the crystal clear waters, or just enjoy a swim and sun. We pull into the Bay of Buenaventura and gear up for the next part of our adventure. Hike up through the jungle, cross suspension bridges, and end up at the entrance to the Zip Line center. Choose between the Extrema zip line ($40) or the Ultra Extreme zip line ($55). Each exhilarating experience takes approximately 2 hours. Afterwards you are free to spend as much time as you wish at the Nature Reserve. Explore on your own, or make you way back to Panajachel and your hotel independently. Lake Atitlan adventure package Atitlan nature reserve zipline paddleboard is great for families, adventure travelers, luxury travelers, or just about anyone looking for fun. 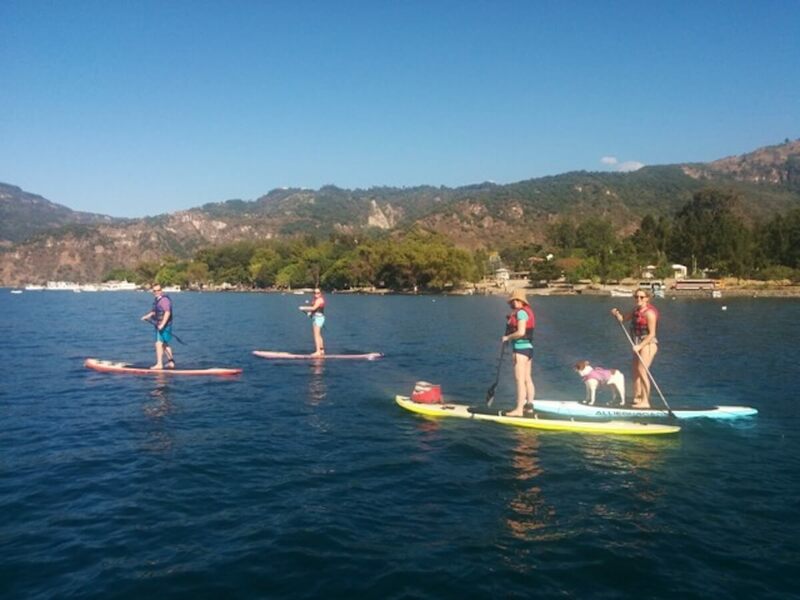 The SUP Mag has a great article about SUP on Lake Atitlan. As you can see from Google Trends, which provides Google search trends over time, the growth of SUP-related searches has seen a great upswing. Google also provides a forecasting tool where the trend is expected to continue rising. Compare this to the same timeframe for other traditional water and paddle sports, and you’ll see an opposing view.